The AquaLounge is the ideal family spa! Each familymember can have there own space in the spa. 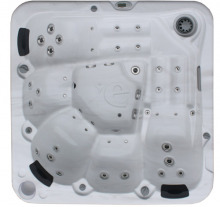 All jets of the Evolution Spa are assembled with Wacker silicone from Germany. This silicone is equal to chemicals, chlorine, water, heat and cold.